Down sleeping bag insulation is the first choice of campers and hikers who need a warm, light sleeping bag. Down is absolutely the best natural insulator known to man. It is made of very small, light feathers of geese and ducks. Even with all the modern technology we have today, down cannot be duplicated! Light, Warm, Compressible, Luxurious, Expensive. Of all the sleeping bag materials on the market, natural goose or duck down costs considerably more than the mass-produced synthetic fills. But if you take care of it the right way, down will last up to three times longer than a bag with synthetic insulation. If you are traveling light, with a small pack, a down sleeping bag is ideal. The lightweight down is just right for small, short people who need a smaller pack. It's perfect for kid sleeping bags. Down is used mostly in the highly specialized mountaineering bags where light weight and protection from extreme cold are the most important concerns. Ultra light sleeping bags tend to be made of down, rather than synthetic, as you would imagine feathers are very lite. The high cost of down and its difficulty in washing make it impractical for most camping excursions. Down has a higher warmth to weight ratio than any man-made synthetic you’ll find on the market. For its extremely light weight, down has an uncanny ability to trap and hold “dead air”. Much less down is needed in a down-filled sleeping bag in comparison to synthetic fibers to achieve the same temperature rating. Thus down does make a smaller and lighter bag. It’s impossible to beat the quality of down, unless it is wet. If your down sleeping bag gets wet on a camping trip, you’ve got a cold night ahead of you! Wet down has almost no insulation power. When down becomes wet, it will actually loose up to 80% of its insulating ability. Down turns into a cold, soggy mess and takes a long time to dry out again. It is essential to keep your down sleeping bag dry. If your sleeping bag has a shell made of a water repelling fabric such as Microfiber or Dryloft, you’ll stand a better chance of keeping it dry even in wet surroundings. Duck down is definitely cheaper than goose down. However, it’s not so durable. Notwithstanding the quality difference, different conditions of use and abuse can outweigh the differences between them. Properly cared for duck down will long outlast more expensive goose down that has been mistreated. The quality of the down is determined by testing a one-ounce sample in a cylinder. The volume that one ounce of down fills is measured in cubic inches. This number is called the “fill power” of the down. So, a fill power of 600 means that one ounce of down occupies 600 cubic inches. Good quality down will be around 500 to 600 fill power. A fill power of 600 to 700 is considered quite excellent. The best fill power available today is 800. The fill power is also a good indication of how much actual downy feather and quill there is in the down. The higher the number that is given, the more feather and less quill. A lesser number means more quill and less feather. Your bag will be loftier and warmer with a higher fill power. Understandably, a sleeping bag with a lower quality fill that has been carefully used and properly maintained will function better than an improperly used, poorly maintained sleeping bag with a higher fill power. The fill power isn’t the only determining factor of quality and warmth. The fill’s effectiveness is also influenced by the design and quality of the rest of the bag, too. A sleeping bag's shape is also an important factor. Each manufacturer’s regulations vary in the production of their down. Even a sleeping bag that is tagged “100 percent down” could have up to 15 percent feathers or fibers in it! Regulations state however that any lesser percentage must be given on the label, such as “75/25”. This means that there is 75 percent down, 25 percent feathers. Check a down sleeping bag before buying to see how the fill is distributed through out the bag. Shake it well to determine how well the fill stays in place. If the baffles, channels, or layers are defective they’ll move away from your body as you sleep. This will affect the sleeping bag’s warmth ability and you won’t stay as warm. In the extreme cold of winter, some campers dislike down sleeping bags. The reason being, that your body releases moisture while you sleep. Then, the down bag gets wet from the inside, even though it is well protected from the outside. This problem is preventable. Just use a vapor-barrier lining inside your bag to keep to the down from absorbing the moisture. Finally, as with all natural fibers, natural goose or duck down can cause an allergic reaction for some people. Be certain you're not allergic to down before you purchase a down sleeping bag. If you are allergic to other animal hair, you may also be allergic to down. Down sleeping bag insulation is just one kind of sleeping bag fill. 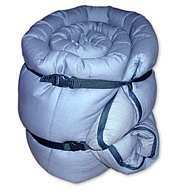 Other sleeping bag fills can be made of man-made synthetics. Only you can make the choice of which kind will work best for you. Your e-mail address is totally secure. We care about your privacy; we don't spam. We promise to only use it for sending you our Camping Newsletter.